“From Rhythmic Robot, the instrument that goes ‘boing’. I’m trying to think who else would collect 38MB of samples of a 1920s laboratory tuning fork and make them into a Kontakt instrument, but the list is pretty short. In common with all the RR instruments I’ve encountered so far, the sampling is clear, impeccable and 24‑bit; just what’s needed to reproduce noisy, nasty technology from the dark ages! There’s no installation as such; you unzip into the folder of your choice, point Kontakt in the right direction and you’re away. Incidentally, as usual, it’s the full version of Kontakt that’s required; any version past 4.2.3 will do. You’re greeted by an interface rendered in simple, attractive graphics. There are just two panels, one of which holds Spark Gap’s effects. Under the main panel’s image of the sparking tuning fork, a mere eight knobs are offered for adjustment by mouse or MIDI. They consist of an ADSR envelope, twin filters and a level control for ‘key off’ samples. This innocent‑seeming knob introduces random sparks, hums and glitches whenever you release a note. With over 60 samples in total, key‑off adds a heck of a lot of character to the base fork tones that form the core of the instrument. 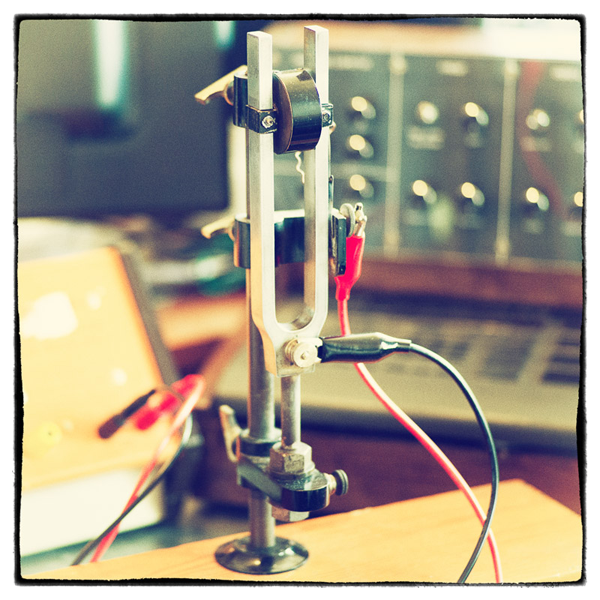 To better appreciate what a laboratory tuning fork is, I recommend a peruse of RR’s web site and its typically entertaining tale of sampling this rare device. Instead of the pure tones usually required for tuning, the tetchy antique’s efforts are constantly contaminated by the shaking of screws or the buzz of the spark gap as it arcs. This latter component proved so attractive that Spark Gap was chosen as the instrument name. When played polyphonically, the grumbling, not particularly house‑broken relic becomes strangely attractive. Using its Sine control, an untainted sine wave is introduced, which helps bind the samples into a more conventional instrument. So what is Spark Gap good for? Clearly, there are relatively few points of control. The filters provide shaving tools for the upper and lower frequencies of the fork’s output and the envelope holds no surprises either. Sonically, Spark Gap could pass for a broken electronic didgeridoo. Some of the random scratches bear a striking resemblance to my violin playing (at least in the effect they have on my wife). Or, with a suitably fast attack, the sine wave turned up and a little ‘key off’ sprinkled into the mix, you get a freaky electronic piano for your troubles. Wonky pads are an easy envelope tweak away too, especially if you use the filters creatively. Finally, if you lose the sine wave altogether, there’s a source of edgy, fidgety atmospheres ideal for that reality show about gastric bands you got landed with. Although you’ll undoubtedly have a better reverb and delay in your DAW, those that are included fit Spark Gap’s character well. For a final dash of sonic seasoning, you can process the output through the convolved impulse responses of a studio condenser microphone or a vintage‑style graphite mic. Spark Gap isn’t hugely versatile but it does have a certain charm. I don’t mind a one‑trick pony as long as it’s a good trick; this one continues RR’s honourable tradition of finding beauty in the old and the knackered. It costs a bit more than you’d expect given its niche oddness, but that’s my only criticism.” – Sound on Sound magazine review. At first, I had a difficult time finding a use for this one. But once to try it and it fits on a track, you realize why you need it. Great texture. Intermittent sonic bliss interrupted by the space that defines time. I Despite wishing to all heaven that this had a glitch button, I simply could not resist its subtle charms. Then, once I started playing with it, I realized that a glitch button would not necessarily result in massive variation with this instrument: It has a distinct voice, and operates within that realm. Its sound, though, is so unique and unplaceable (if you don’t know what it is). It is fragile, ragged, resolute, fearless, exposed, raw, subtle, and primordial. It does one thing, but that one thing is amazing. This is another one of those instruments that intrigues, rather than bludgeons the listener. You think you’re hearing something unadorned and simple, but there’s something going on that you are compelled to try to figure out with your brain. I love sounds like that. They are deceptive, but very noticeable. It’s the subtleties that absolutely make this one, for me. When the Fairlight CMI came out, there was a sound sampled from a very breathy singer (called Sarah) and that sound finished up on everything, because you just couldn’t ignore it. I think the sounds in Spark Gap have a bit of the same thing going on. You want to hear more. The more you hear, the more you anticipate. This is so cool! It sounds a bit like a big, bowed wineglass, but with its own kind of grit. With only a few samples and no round robins you’d expect it to sound static, but it’s got random sample starts and LONG samples (+random note offs), so it sounds very alive indeed. Sounds good on its own, but also very cool when you add Rotator, Chorus or Phaser/Flanger. 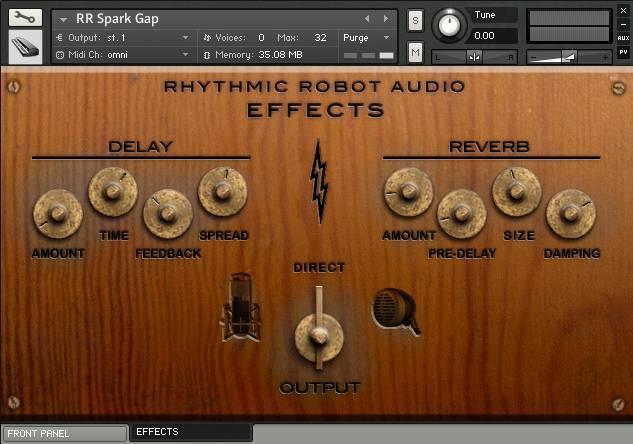 Spark Gap produces beautiful sounds with as much noises you want it to generate. I first thought it would be a one-trick-pony, but its very simple controls allow to shape the sound in lots of very useful ways that makes it a lot more versatile than it looks. Great work RR! This is all about overtones. Noise overtones, and it’s not vinyl, and it’s not tape hiss, it’s… what is that exactly? That’s what people will ask you. And these days, getting that question is what you want. Spark gap. I’m in. Spark Gap has an eerie and original character. Is fantastic when you play chords, and playing single notes remind me a rusty musical saw with a steampunk mechanism! It clicks, sparks, screeches and seems to be alive! Spark Gap is not going to work every time you reach for it, but when it does work, it’s magical! I use it for unusual keys textures with a unique lo-fi vibe. Beautiful. It’s the perfect balance of sweetness and tooth-jarring texture: wonderfully musical and utterly charming. It speaks of Bagpuss and the sea. This is such a cool instrument to add unusual sounding textures to you music. It is the opposite of sterile! 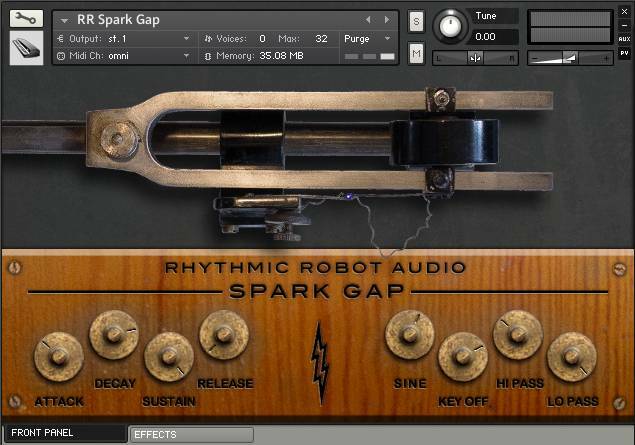 Easy to play with, if you search an instrument to explore new sound, Spark Gap is the one. Open your ears ! Beautiful textures with unique personality, this instrument is great for experimentation and some unexpected colors! Yet another Spark of inspiration from Rhythmic Robot! Aside from ambient pads and chords, I’ve found that this can make a really good lead! Sure, it doesn’t growl or scream, but something about the timbre works great with eerier melodies. Simple, yes. But perhaps that’s the beauty of it. Very lovely and delicate sound. When you’re about to reach for a violin patch, try reaching for this instead. Great price and also great dusty sound. Very helpfull to achieve steampunk sound, it could works as legato stings for pieces which reqiure somethings unusual. 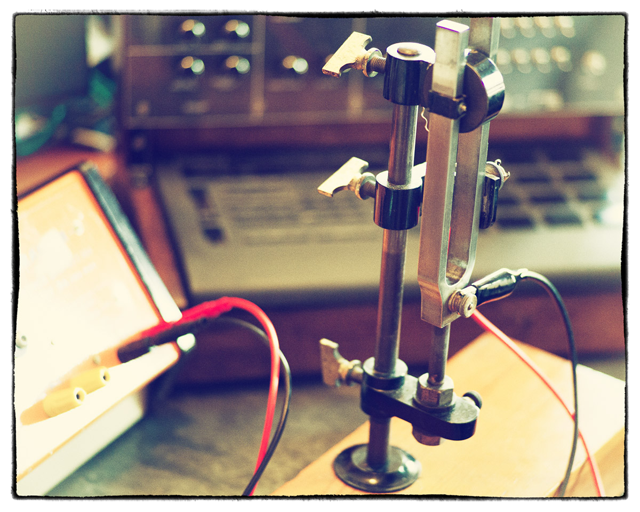 Instantly inspiring instrument that excels as a focal point for ambient music. It’s also excellent as an additional instrument for other genres of music if you have an open mind for such a timbre. Lately, it’s been a go-to plugin for an experimental hip-hop project I’m working on. Highly recommended for those open to unusual and quirky tones/timbres. have to experience it. I think of it as a fine spice used just right it will ad flavor to your next creative endeavor. You might find yourself asking if you need an instrument that only really does one, rather odd thing… and no, you don’t NEED it. But if you’re doing any sort of sound design or other weirdness, it’ll worm it’s way into that pile of go-to patches simply because that one thing is very, very useful, and very well realised. In a word, characterful. Spark Gap has really inspired recent work for me. I can’t praise this value-for-money instrument more highly. Easily one of my favorite Kontakt instruments ever. So quirky, lo-fi, beautiful and most importantly; unique. Probably not for fans of epic Lord of the Rings style soundtracks, more suited to fans of early Sigur Ros…if that makes sense (?). In world of endless grand piano and symphonic instruments, Rhythmic Robot keep making things like this which set them apart from many other producers. Oh, and Shortwave is amazing too.